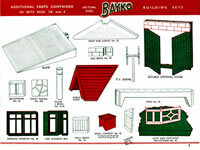 When, on July 1st, 1959, BAYKO launched the new Garage Doors [officially referred to as Opening Doors, at least initially] they decided that they would include this potentially popular new part in the larger sets. The Garage Doors did make the illustrated parts list at the back of the final Plimpton era catalogue. This, of course, left their retailers with older sets which didn't include the new Garage Doors. To solve this problem, BAYKO wrote to all their retailers, asking them how many old sets they had and thus how many Garage Doors they needed to bring these sets up to the new standard. …the cynics among you may point to the “1/6”, [1 shilling and 6 pence or 7½p] hand-written price on the box in the image [right] to suggest profiteering by the retailer - such unworthy thoughts!!! 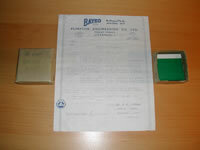 The picture [right] shows the 'full set' - the original Plimpton letter; the Garage Doors; and the packaging just as they were received by the BAYKO retailers. …this must have been a 'deliberate mistake'!!! Click here for more information about this mistaken document.